UMW Economics Professor Robert S. Rycroft has won a 2018 Independent Publisher Book Award for The American Middle Class: An Economic Encyclopedia of Progress and Poverty. The two-set encyclopedia released last May was awarded a bronze medal in the reference category. “I wanted to address the wide range of issues that have influenced, currently influence and will influence the way the middle class see the world,” Rycroft said of his winning book. Those issues include economics, labor, education, housing, politics, public policy, health, crime, norms and culture. Robert S. Rycroft has won a 2018 Independent Publisher Book Award for The American Middle Class: An Economic Encyclopedia of Progress and Poverty. (Norm Shafer). “It is not a textbook. Rather it is a reference book likely to be found in many libraries’ reference sections as an aid to students doing research in the general area of the American middle class,” Rycroft said. Rycroft holds a Ph.D. and M.A. from the University of Maryland. He received his bachelor’s in economics from the College of William and Mary. He is a member of Phi Beta Kappa and the American Economics Association. This is his 41st year at UMW and his first Independent Publisher Book Award. “I am thrilled beyond belief,” Rycroft said. 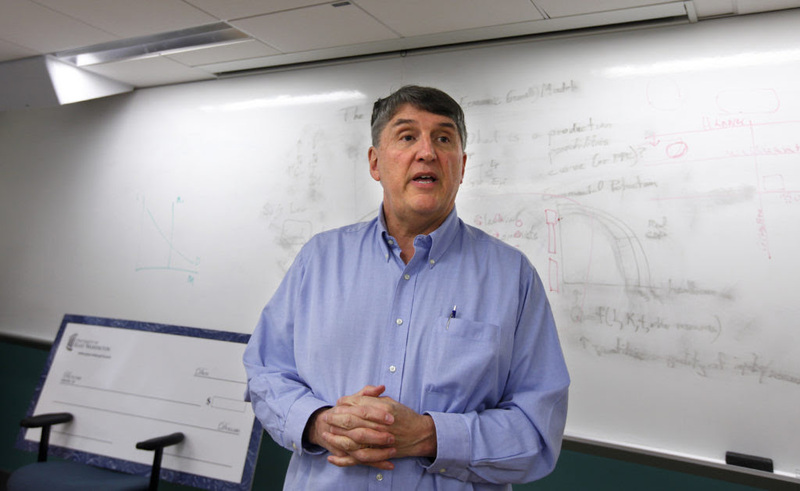 In addition to The American Middle Class, he is the author of Essentials of Macroeconomics I and II (1989), Hits on the Web: Mankiw Edition (2003, with Carol Lee Clark and Michael R. Dowd) and The Economics of Inequality, Discrimination, Poverty, and Mobility (2009 and 2018) and The Economics of Inequality, Poverty, and Discrimination in the 21st Century (2013). He is currently co-editing Inequality in America: Causes and Consequences of the Rich-Poor Divide, scheduled for publication in 2020. The Independent Publisher Book Awards (known as the “IPPYs”) have recognized since 1996 the thousands of independent, university and self-published titles published each year, according to the organization. The awards are open to all members of the independent publishing industry and pay tribute to a range of subjects, including biography, science, sports, fiction, children’s books, science fiction, history, travel and education. There are more than 5,500 entries vying for awards in 83 categories.